Glomerella leaf spot (GLS), caused by Colletotrichum spp., is one of the most important diseases of apple. In this study we aimed to identify Colletotrichum species associated with GLS from different apple-producing areas in Southern Brazil and assess their differential pathogenicity towards apple. Sequencing and multilocus phylogenetic analysis using partial gene regions of ITS, GAPDH, TUB2, ACT and HIS3 allowed the identification of eighteen isolates of Colletotrichum fructicola, and only one of Colletotrichum nymphaeae. All isolates were pathogenic to apple leaves, while C. nymphaeae did not cause symptoms. 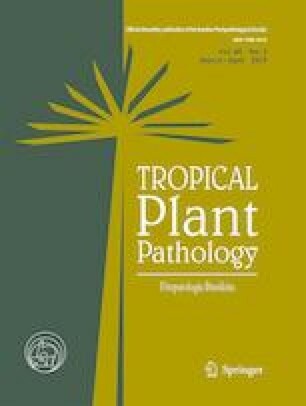 Worldwide, our literature review showed nine Colletotrichum species reported associated with GLS in different countries: C. fructicola, C. nymphaeae and C. karstii in Brazil; C. fructicola and C. aenigma in China; C. fructicola, C. aenigma and C. siamense in Japan, C. fructicola, C. alienum, C. gloeosporioides, C. siamense, C. tropicale and C. fioriniae in the USA, and only C. fructicola in Uruguay. Our study confirms C. fructicola as the most frequent species causing GLS in Brazil and discusses the diversity and pathogenicity of GLS-causing species worldwide. We thank the Brazilian agency CAPES (Coordination for the improvement of higher education Personnel) for financial support (Grant: PPCP-MERCOSUL 022/2011). We also thank Dr. Rosa Maria V. Sanhueza (PROTERRA) and Dr. Leonardo Araújo (EPAGRI) for providing some of the isolates used in this study. M.J.S is a research member of the National Council for Scientific and Technological Development (CNPq).